The Videos section of the Album in Scenes mode. The icons shown here represent the scenes within a particular movie file. Controls are provided (top) for accessing other movie files anywhere on your system. Click the tabs down the left side of the Album to access the materials in the other sections. With the current explosion of digital media technologies, it is easier now than ever before to obtain high-quality media items and incorporate them in your productions. Many types of media and resource can serve as ingredients in Studio movies in addition to just video. Starting with visual elements, you can include digital photographs and art, fancy titles and animated transitions. As for audio, you can spice up, or even replace, the source video’s own soundtrack with music, sound effects and voice-overs. Then there are the special items. For a DVD disc you will want to include attractive navigation menus, while for polish and pizzazz in any production you can turn to Studio’s Montage® theme templates, which let you recombine other resources into dynamic and creative video layouts. Your Studio software installation already includes an extensive collection of professionally-authored resources, and numerous bonus packs are available as well. Further afield there are practically limitless possibilities for using all kinds of additional media, whether of your own creation or from other sources. Keeping track of this abundance of riches could easily become a challenging task in itself, but Studio provides two key management tools that let you navigate and access your media assets with ease. The Album provides intelligent browsing of your entire media collection. It lets you quickly locate and preview any desired item, then introduce it into your production simply by dragging its icon into the Movie Window. All your projects share and make use of the Album, which is a permanent feature of Studio’s Edit mode. The Project Bin is a special version of the Album dedicated to handling the resources needed by the current project. Media items you add to your movie, are included in the Bin automatically, but you can also add items directly so that they will be handy later on. The Bin lets you collect and file all the materials you need for a production, and keep them at your fingertips throughout the editing process, ready to use whenever your project is loaded. Most of the concepts and operations described for the Album apply equally to the Bin. Video: This section contains video footage you have shot or otherwise obtained. The supported video file formats are: avi, mpg, mpeg, mod, mp2, mp4, m2ts, mt2, m2t, tod, m1v, m2v, mpv, 3gp, wmv, mov and skm. You can access and preview files directly, or you can open an individual file to access its contained scenes, which are represented by thumbnail icons. To use some of the scenes in your movie, just drag their icons into the Movie Window. See The Videos section. ons: This Album section contains fades, dissolves, slides, and other transition types, including the elaborate Hollywood FX transitions. To use a transition, position it next to or between video clips and graphics in the Movie Window. See The Transitions section. Montage® Themes: A Theme in Studio is a set of matching templates. You can use the templates to create effective sequences that combine your video and still images with built-in animations and effects. See The Montage® Themes section. Titles: This section contains editable titles, which you can use as overlays or as full-screen graphics. You can create your own titles from scratch, or use or adapt the supplied ones. Studio supports rolls, crawls, animated motions, and many typographical effects. See The Titles section. Photos and Frame Grabs: This is a section of photographs, bitmaps and grabbed video frames. You can use these images full-screen or as overlays on the main video. Most standard image file formats are supported: bmp, dtl, gif, jpg, jpeg, pcx, png, psd, tga, tif and wmf. See The Photos and Frame Grabs section. Disc Menus: Studio has an extensive collection of chapter menus to use in DVD, VCD and S‑VCD authoring. You can use these as they are, modify them, or create your own. See The Disc Menus section. Sound Effects: Studio comes ready with a wide range of high-quality sound effects. You can also use files that you have recorded yourself or obtained from other sources. The formats supported are: wav, mp3, mpa, m4a, wma, avi and ac3. See The Sound Effects section. Music: In this Album section you can locate and use music files stored on your hard drive. The formats supported are the same as those for sound effects. See The Music section. A dropdown list of folders is displayed in all Album sections. In some, like the Photos and Frame Grabs section, where the folders represent actual directories on your hard drive, additional navigation controls are also provided. 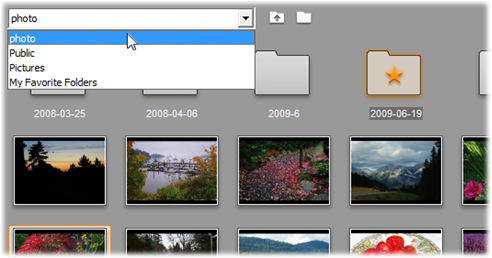 A dropdown list of folders in the Photos and Frame Grabs section. Here the current folder contains both image files and subfolders, one of which has been designated a ‘favorite’ (starred). Favorite folders can be quickly retrieved by clicking My Favorite Folders in the list. The resources in each folder are represented by icons. If there are more than will fit the display, a scroll bar provides access to the rest. At the top right of each Album page, Studio shows the total number of items in the folder, and the range that is currently visible. The readout above the scroll bar shows that the first 18 of 19 icons are currently on display. All types of Album content can be previewed simply by clicking on the icons. Most Album sections contain ordinary media files of various types, but there are three exceptions. The scene icons in the Scenes mode of the Videos section represent segments within a particular video file, while the icons in the Transitions and Themes sections represent special resources associated with the Studio program. The other five sections, however, and the Files mode of the Videos section, present the files contained in some particular disk folder. The icons in the Titles section represent files stored in a selected source folder on your hard drive. The dropdown list at the top of the Album page lets you select from any of several installed folders of titles. The folder button beside the list lets you access titles in folders other than those listed if required. The Disc Menus section works similarly. The source folder for each section’s content is listed in the dropdown list at the top left of the Album, next to a small folder button . To change the source of the current section, either select a folder from the dropdown list, or click the button, browse to another folder on your system, and select any file. The file you select will be highlighted in the repopulated Album section. Some Album sections also provide a parent folder button to facilitate moving around within a group of folders containing media of the same type. File-based media in the Album provide a context menu command, Open Containing Folder, that opens a Windows Explorer window with the given file selected.